Lower tax rates. The Tax Cuts and Jobs Act of 2017 (hereinafter referred to as the “new law”) reduced tax rates for most taxpayers, effective for the 2018 tax year. Tax rates are lower and tax brackets are wider resulting in an even larger tax savings. The top tax rate has been reduced to 37% from 39.6% under the prior law. Additionally, many businesses, including those operated as passthroughs, such as partnerships, may see their tax bills cut. How much tax will I save under the new rates? Below is a table that illustrates the effect of the tax rate changes alone. There are other tax law changes that will invariably increase or decrease your overall tax liability. Reduction in Marriage Penalty. The so called marriage penalty is caused by the fact that married tax rate brackets are not twice that of single tax rate brackets. 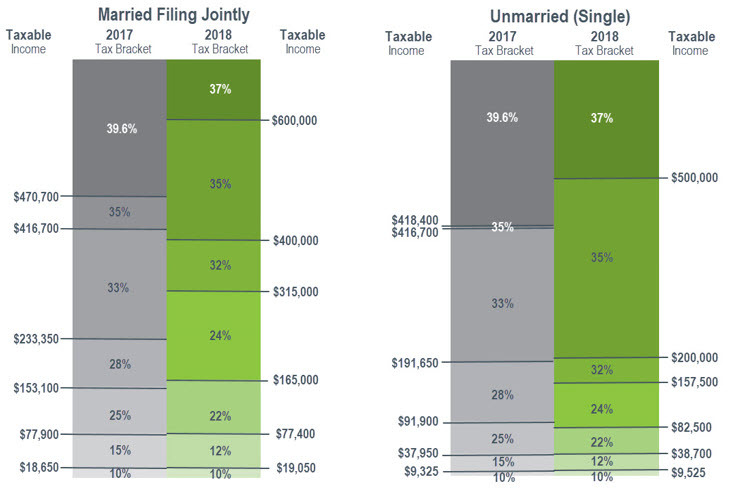 The new tax rates effecting eliminates the marriage penalty for couples earning less than $600,000 by reducing the married tax rates more than the single tax rates. Personal exemptions and standard deduction. The new law eliminates the deduction for personal exemptions and nearly doubles the standard deduction. For taxpayers with children under age 17, the loss of the exemptions, in many cases, is more than made up for in a doubling of the Child Tax Credit – see next paragraph. The standard deduction amounts are indexed for inflation for tax years beginning after 2018. The higher standard deduction will simplify the tax filing for taxpayers who have in the past itemized their deductions but now won’t have to unless they exceed the new higher standard deduction. Child Tax Credit. The enhanced child credit has been highlighted as one of the provisions that will lower overall tax liability for middle-class families. The new law temporarily increases the current child tax credit from $1,000 to $2,000 per qualifying child (up to $1,400 of that amount is refundable). The child tax credit is also expanded to provide for a $500 nonrefundable credit for qualifying dependents other than qualifying children. More families will be able to take advantage of the credit due to an increase in the adjusted gross income phaseout thresholds, starting at $400,000 for joint filers ($200,000 for all others). • Mortgage interest deduction. The new law limits the mortgage interest deduction to interest on $750,000 of acquisition indebtedness ($375,000 in the case of married taxpayers filing separately), for tax years beginning 2018 through 2025. For acquisition indebtedness incurred before December 15, 2017, the Tax Cuts and Jobs Act allows current homeowners to keep the current limitation of $1 million ($500,000 in the case of married taxpayers filing separately). Taxpayers may continue to include mortgage interest on second homes, but within those lower dollar caps. However, no interest deduction will be allowed for interest on home equity indebtedness not used to purchase, build or substantially improve the home. • State and local taxes. The new law limits annual itemized deductions for all nonbusiness state and local taxes deductions, including property taxes, to $10,000 ($5,000 for married taxpayer filing a separate return) for 2018 through 2025. Sales taxes may be included as an alternative to claiming state and local income taxes. • Miscellaneous itemized deductions. The new law repeals all miscellaneous itemized deductions for tax years 2018 through 2025 that are subject to the two-percent floor under current law. This includes investment advisory fees, tax preparation costs, and unreimbursed employee expenses. • Medical expenses. The new law lowers the threshold for the deduction to 7.5% of adjusted gross income (AGI) for tax years 2017 and 2018. Moving Expenses. The new law eliminated the deduction for moving expenses for 2018 and subsequent years which had been deductible if related to a job change. There is an exception for members of the military on active duty who move pursuant to a military order. Education – 529 plans. The new law expands qualified distributions made after December 31, 2017. Plan participants may withdraw not more than $10,000 in expenses for tuition incurred during the tax year in connection with the enrollment or attendance of the designated beneficiary at a public, private or religious elementary or secondary school. This limitation applies on a per-student basis, rather than a per-account basis. Estate and gift tax. For the estates of decedents dying and gifts made after 2017 and before 2026, the basic exclusion amount for purposes of federal estate and gift taxes is doubled from $5 million to $10 million, as adjusted for inflation. For a married couple using portability, the maximum applicable exclusion amount would be doubled again to $22.4 million. Corporate Taxes. A reduced 21-percent corporate tax rate is permanent beginning in 2018. Also, the 80-percent and 70-percent dividends received deductions under current law are reduced to 65-percent and 50-percent, respectively. The new law also repeals the alternative minimum tax on corporations. 20% Qualified Business Income Deduction. Owners of partnerships, S corporations, and sole proprietorships – so called "pass-through" entities – pay tax at the individual rates. The new law allows a temporary deduction in an amount equal to 20 percent of qualified income of pass-through entities, subject to a number of limitations and qualifications. Bonus Depreciation. The bonus depreciation rate has fluctuated wildly over the last 15 years. It is often seen as a means to incentivize business growth and job creation. The new tax law temporarily increases the "bonus depreciation" allowance to 100 percent and extends it to both new and used qualifying asset purchases. Section 179 Expensing. The new law sets the Code Sec. 179 dollar limitation at $1 million and the investment limitation at $2.5 million. Although the differences between bonus depreciation and Code Sec. 179 expensing would now be narrowed if both offer 100-percent write-offs for new or used property, some advantages and disadvantages for each will remain. Entertainment Expenses. The new law eliminated the deduction for entertainment expenses which had been 50% deductible. The deduction for business meals, including food and beverages during entertainment events, were not eliminated and are still 50% deductible. Meals and entertainment expenses that are reimbursed to an employee and included in the employee’s taxable income are still fully deductible as wages.